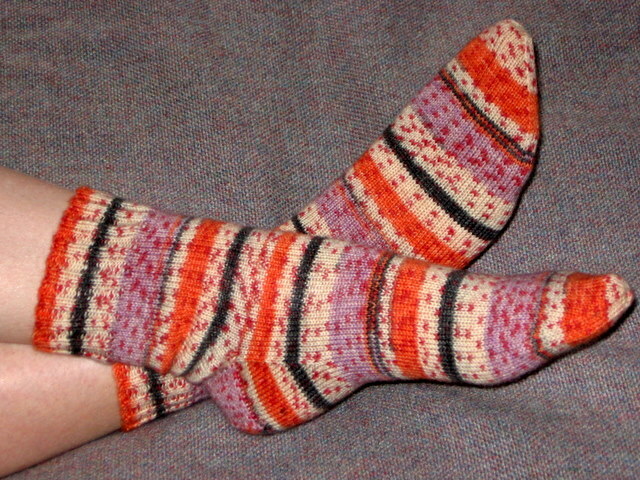 It seems like this project has taken me forever, but I have finally finished my third pair of socks. 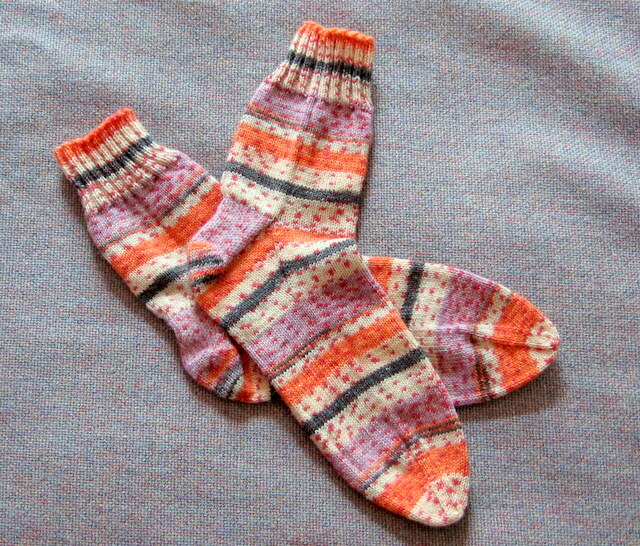 These are plain socks, knitted up in Opal's Crazy colourway 1906, using the generic sock instructions as set out in the Yarn Harlot's Knitting Rules!. They're worked on 2.5mm needles, with a gauge of 8 stitches per inch - I'm wondering if that's normal or if I'm becoming a tight knitter? I did have problems with tension in the heel for the first sock, which I've reinforced by slipping every other stitch, but other than that they've been a fairly straight forward knit... So I'm at a loss as to why they've managed to take a good six weeks to finish! The only thing I can think of at the moment is the yarn. I didn't particularly like working with the Opal. It was very splitty, hard on the hands and just didn't seem to have as much give as the Regia yarn I used for the previous two pairs I've knit. The resulting fabric seems much stiffer with less drape than the Regia, although I've been assured they will soften once I've had a chance to wash them. However, they sure are eye catching!